Staying active is an important part of cancer treatment, recovery and overall well-being. All wellness programs are free to anyone impacted by cancer; both survivors and caregivers. Patients in treatment, or up to 6 months post treatment , as well as their caregiver, may pick up coupons to redeem for Massage, Reiki, Reflexology or Therapeutic Yoga from our list of pre-approved wellness providers. Survivors receive (4) coupons and their caregiver receives (2) coupons. All wellness providers have been through an approval process with the CRCWM's program committee. Call or stop in to pick up coupons. We are happy to announce that Swimming Passes are now available through a partnership with the Hampton Inn, Oxford in their salt water pool. This new program includes a one month unlimited pass for cancer survivors who have been out of treatment 6 months up to five years Their caregiver is also eligible to receive a one month pass as well. Survivors and caregivers interested in receiving a pass for swimming should stop in at CRCWM or call 890-0329 for more information. The CRCWM reimburses the Hampton Inn for their services. This program is made possible by grant funding restricted to providing a variety of Wellness Programs for cancer survivors and caregivers. For more information, please call the Center at 890-0329. Pre-registration is encouraged. Yoga has many benefits for the whole body, including flexibility, strengthening, balance, stress reduction, and lubrication of joints - just to name a few. Yoga is offered to cancer survivors and caregivers via our Caring Coupons Program. All Yoga poses and breath work will be tailored to the needs and ability of the individual. For more information about our Caring Coupon Program, email info@crcofwm.org or call (207) 890-0329. This is FREE class for cancer survivors, caregivers and those in treatment. Classes are held at Posabilities, 15 Tannery St. Norway, ME. Check our calendar of events for dates as it varies. Reiki is a gentle touch that promotes relaxation; reduces stress; helps relieve pain; and may improve sleep. Reiki 1 - Self Care will offer you relief from some of the stress and discomfort you may be experiencing. ​Reiki complements the medical treatments prescribed by your physician. Reiki 1 - Self Care is held monthly at the Cancer Resource Center. Check our calendar of events for dates as it varies. Reiki is also offered by several providers in the greater Norway area. Email the Cancer Resource Center at info@crcofwm.org or call (207) 890-0329 to learn how to take advantage of Reiki via our Caring Coupon Program. Reflexology is an alternative therapy involving application of pressure to the feet and hands with specific thumb, finger, and hand techniques. Patients may choose from a hand or foot session of gentle touch. Reflexology is offered by several providers in our Caring Coupons Program. Banding Together to Restore is an exercise class taught by Lori Britting who will provide guided instruction focusing on regaining motion and strength through stretching and the use of Therabands. 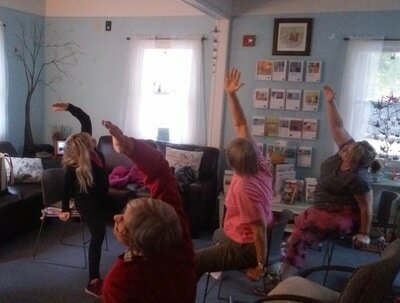 This class is held at Richard Bader Physical Therapy, 176 Main St., Norway, ME. Check our calendar of events for the dates.